Using my previous analysis of the draft, this post examines two things: first, how much the Redskins actually paid for Robert Griffin III, and second, how well RGIII has to perform to justify this price. Because this trade involves future draft picks whose exact overall number is impossible to know, we must assign some value to them. Since teams cannot know what draft position they will have the following year, I assume that the expected value of those picks is the average of the picks in that round. For example, a future first round pick is worth the average value of all picks in the first round. Using this assumption, I evaluate this trade and compare it to the Julio Jones and Ricky Williams trades from previous years. From an expected value perspective, the Redskins definitively lost this trade (to put it mildly). The second overall pick carries an expected Career Approximate Value Over Average (eCAVOA) of 435.4. The 6th and 38th overall picks have a combined eCAVOA of 525.1. If the Redskins had given up just these picks, they would have lost 89.7 eCAVOA, which is the equivalent of the 114th overall pick (the middle of the 4th round). If this price had been the extent of the trade, it would have been defensible. A 525.1 eCAVOA translates to a CAV of 78.7, essentially equaling Matt Hasselbeck’s CAV. So RGIII would have only had to equal Hasselbeck for this trade to be equal. However, the Redskins gave much more: their next two first round draft picks. The average expected value of a first round pick is 276.8 eCAVOA, which brings the total eCAVOA the Redskins gave up to 1078.7. The Rams only gave up 435.4 eCAVOA, giving them a net gain of 643.3 eCAVOA, equivalent to the first and 57th overall draft picks. This equation cannot be solved where surplus value = 0. Even if r equaled infinity, this equation would not balance without a surplus. The only way it could be possible would be if the Redskins negatively valued their future first round draft picks. Given their previous willingness to trade away picks, this may not be far off. However, assuming that having first round picks is actually good for your team, this trade is awful for the Redskins. An eCAVOA of 228.3 equates to the 22nd overall pick. So with this trade, the Redskins lost the expected value equivalent to the 22nd overall pick. But let’s not jump to conclusions. RGIII could be better than the average second overall pick. In fact, he could be the best second overall pick ever. So how good does RGIII have to be to justify this trade? Given the discounted value of the future draft picks, the total price the Redskins paid was 753.5 eCAVOA. That price translates to a CAV of 113.0, comparable to Tom Brady’s current production to date (109 CAV). For the Redskins to get the equivalent value from RGIII as they spent acquiring him, he must produce at least as much as Tom Brady. If RGIII merely lives up to his eCAVOA, he’ll finish his career having slightly outperformed David Garrard (61 CAV). Because all-time-great quarterbacks are rare commodities, the Redskins likely lost value both on paper and in reality. This trade is very comparable to some of the most lopsided trades from the past few years. Last offseason, the Atlanta Falcons gave the 26th, 69th, and 124th, overall picks along with their 1st and 4th round picks this year for the 6th overall pick, which they used on Julio Jones. The calculations below determine the value they lost from this trade. This calculation shows that the Falcons sacrificed almost the exact same value to acquire Jones as the Redskins did for RGIII. For the Falcons to get the same value from Jones as they spent drafting him, he must perform similarly to Keyshawn Johnson (78 CAV). For what it’s worth, the Redskins trade is still much better than the Saints’ trade for Ricky Williams. In 1999, the Saints traded the 12th, 71st, 107th, 144th, 179th, 218th, along with a first and fourth rounder the following year for the 5th overall pick. That surplus is almost exactly double what the Falcons and Redskins gave up in their trades. For the Saints to get the production that they paid for out of Williams, he would have had to perform as well as Barry Sanders (CAV of 122). A Hall-of-Fame career is too much to expect from any draft pick. Regardless of the rationale behind this move, the Redskins lost a tremendous amount of value in this trade, potentially setting the team back for years. If RGIII does not pan out – whether because of talent or injury – Washington would be left with no quarterback and no first round draft picks for the next two years. Regardless of RGIII’s future, the Redskins lost about as much expected value as the Falcons gave up last year to acquire Julio Jones. 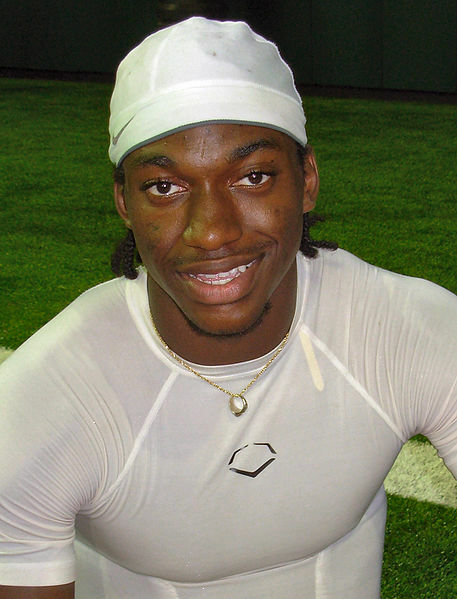 While RGIII will bring excitement to Washington, the conclusion here is clear. This trade was a bad move by the Redskins, and one of the worst moves in recent history. Vintage Redskins. If one goes back far enough, the Hershel Walker trade was perhaps the worst in NFL history; how does this one compare to that? At least Walker was an established NFL star, RG3 was an unknown. There was no way Washington could even know if he would pan out, since he didn’t play in an NFL style offense. He could have been the next DeMarcus Russell. It’s one thing to take a risk with a high draft pick on a highly talented player, it’s quite another to give up 4 high draft picks on an unknown. Simply applying a numerical value to this trade is a mistake. Numbers dont take into account the staggeringly awful past 20 years for the Redskins and their fans. The Redskins have been chasing a true franchise QB since Joe Theisman. The team has been terrible, yet just good enough to not have a chance to be in the hunt for a pick high enough to draft a true franchise QB. Did they pay too much. By the numbers, yes they did. But the boost to the franchise and its fans cannot be measured in numbers. A temporary boost means nothing. That franchise is a mess. Ownership there is a joke and I am certain that they will remain a mess, regardless of the possible success of a “franchise” QB. 1. The Redskins will NEVER win the Superbowl as long as Daniel Snyder owns the team. 2. The Knicks will NEVER win the NBA championship as long as James Dolan own the team. However, going back to the Trade. I don’t mind it at all. Had we NOT made this trade, we would have been stuck overpaying for Matt Flynn (Unproven Backup) or bringing Kyle Orton to compete with Rex Grossman as starter (and we’d say Hello to 5 wins next year too). Overall, we paid a heavy price but that’s what the market called for. Browns were willing to give up Three 1sts, so we needed to throw in this years 2nd. And I’m glad we did. I wish RG3 The Best and hope as an organization we can turn this thing around! I appreciate your thoughts and insight into the value lost in trading for the #2 pick. However, one very important (somewhat un-quantifiable) factor remains. It’s more important for a football team to have a quarterback with a high CVOA than any other position. How much important is that factor? Given today’s rules and trends, it’s a factor in any equation determining the value of a draft pick. While the Redskins roster overall could have had a higher CVOA if the future 1st round picks remained in our possession, I highly doubt that the ultimate football statistic – wins and losses – would have been better for it. The team will get more bang for the buck by using those future picks to get an elite quarterback now. You are missing the point that Washington could have selected two better QBs at number 6, Wilson or Tannehill, than they got in RG3. Well said Brad. In order to make a better argument, the author should’ve compared this trade to the Elway or Manning trade. Also, the rookie wage scale wasn’t factored into the analysis at all. If the wage scale wasn’t in place, the Redskins wouldn’t have had to give up as much therefore it wouldn’t have seemed like such a lopsided trade. It’s time to throw the Jimmy Johnson draft chart out of the window. Your completely discounting the potential 4 starters you lose from the picks, all of whom are also under the new rookie wage cap scale. Nows the best time to use as many picks as you can get, not give them away. The best value for any nfl team from starters now comes from the draft. I’m not sure that your numbers factor in the new rookie wage scale to assign values to draft picks. I think the cost-prohibitive contracts the top picks used to get actually deflated the value of those picks. I would be curious to see if your calculations factored in today’s Wage scale…I don’t think you can just whip out Jimmy Johnson’s draft pick value sheet from 1991 and apply it to the drafts from this year forward. You can get a locked in potential starter for 5 years at cheap rookie rates. Skins gave up potential starters that could have helped their salary cap. Fundamentally, the Redskins philosophy of free agents over building through the draft continues, and with that continued futility. There is a ton of pressure now on this kid with no offensive line or receivers to throw to. They will ruin him. No receivers? The Redskins top 2 WRs could be Vincent Jackson and Santana Moss and their top 2 TEs are Fred Davis and Chris Cooley. That is plenty of pass catching options. And while the OL needs help in 3 or 4 spots (not LT as long as Trent Williams has been scared straight…. ), RGIII’s mobility will help offset those issues, especially with the Shanahan offense that likes to move the pocket. Also, the build through FA and not the draft hasn’t been the approach in the Bruce Allen/Mike Shanahan era. Just look at the fact that the Redskins had 11 draft picks in last year’s draft. I also wouldn’t rule out the Redskins making some moves to add more picks moving forward. But, getting RGIII isn’t status quo at Redskins Park. Getting Peyton Manning would have been. Ryan Tannehill put up better numbers in Miami behind the worst offensive line in the NFL this year. RG3 simply holds the ball too long. The redskins have good receivers & a running game. This is simply ridiculous. If the Skins make the playoffs for multiple years, no matter if a SB is won, the deal was good. If hes a 2nd string QB in a few years, well then yes, they lost. But to say he needs to be Brady is silly. Ill take a Drew Brees career any day. Or even a Phillip Rivers. With them, you at least got a shot. Without them, you dont. The Redskins win the offseason again! While it’s a steep price, they desperately need a QB, and I don’t know of any QBs of this caliber in next year’s draft. The other dimension that can’t be quantified at this point is the impact that RG3 on the Washington fan base. DC is a pro football town, but Snyder can’t risk alienating the fan base further. I don’t know why they made this trade before free agency. Maybe STL was telling them that CLE was going to make them a better offer (and give STL a better shot to land Justin Blackmon), WAS blinked and made the trade. Maybe it was the reports that Manning won’t go to WAS helped STL push a harder deal. I’m willing to bet, by this sort of metric/analysis, the Giants made a relatively big mistake trading for Eli Manning… yet does anyone actually think there’s a single ounce of regret in that organization or fanbase for making that deal now, no matter what he does for the last half of his career or some of his “Bad Eli” moments in his past? I appreciate the effort clearly put into this and obviously the Redskins are taking a huge chance, but it’s not Tom-Brady-II-Or-Bust — there’s other ways this deal can pay off for them. It’s not black or white, no other shade possible. I am going to say that RG# has to be Tom Brady to provide value is false. This is because when evaluating a trade for multiple players, there are several other variables, like other players you can acquire and ones you already have. My example below. Say that there is a very simple fantasy game with only 4 positions you an start QB, RB, WR, TE and you may have a backup who doesn’t count for anything. The teams in this trade are I Hate Math and I Love Truth. I Hate Math has QB1 worth 34 fantasy points, RB2 worth 8 fantasy points, WR2 worth 7 points and TE2 worth 6 points for a total of 55. I Love Truth has QB2 worth 17 points, RB1 worth 15 points, WR1 worth 13 points and TE1 worth 10 points for a total of 55 points. They both have backup QB3s worth 8, WR3s worth 3, and TE3s worth 3 these figures are half of the worst player at the positon. I Love Truth trades QB2(17), WR1(13), and TE1(10) for QB1(34) from I Hate Math. Clearly, according to your model, I Love Truth wins because 40 is larger than 34. Also if we look at the teams I Hate Math now has QB2 (17 points), RB2 (8 points), WR1 (13 points) and TE1(10 points) for a grand total of… 48 points… wait a minute- they should have gained 6 points, not lost 7. This is because you don’t get to count the other players, because they are on the bench, they might help slightly in real football as a backup, but not by much. Meanwhile, you can’t say I Love Truth actually lost because QB1 (36 points) plus RB1 (15 points) is equal to 51 points-greater than 48. You could say both teams lost then, as there totals are worse than 55, there starting point. However, like in real football with backups, and free agents, I Love Truth can now play a backup at WR and TE. QB1 (36 points), RB1 (15 points), former backup WR3 (3 points) and TE3 (3 points) for a total of 57, greater than 55. Another thing to add to this discussion what if each team could sign 1 free agent. FAQB (23 points), FARB (11 points), FAWR (10 points), and FATE(8 points). Values are rounded averages of player 1 and player 2 except the value for a FAQB is skewed, because this is a comparison to find an average starter and the one star, (outlier) raises the “average” in this case, so I lowered from 26 to 23. This is like comparing Phillip Rivers, and Sam Bradford to find the average value, its just not correct. Note: I am truly using made up numbers at the start, except for valuing QB higher, lowering 26-23 is a guestimation. So I Hate Math would grab FAQB and gain 6 points, and I Love Truth would grab FAWR and gain 7 points. As you can see, this comment represents why RG3 is so valuable- position scarcity. You will always have backups, so if the total value is higher as it is in the RG3 trade, you have to look at how the trades affects the other holes. By adding one player you lose the value of the former player and by trading away a player you gain the value of his backup. Your stats are right, your use of them and inclusion of other players makes saying RG3 has to be Tom Brady ridiculous. You don’t know the draft picks are so that this kind of analysis is not possible at the current moment. Another thing to consider would be money looking at Cam Newton’s contract RG3 should cost $22 million for the first 4 years of his contract. The 6th pick will cost about $16.5 million. The 38th pick about $5 million. Saying the 2013 and 2014 pick are 15th, (dead center), they would cost a total of about $18 million. So RG3 appears to win, but he will get a much more significant raise if signed to his 5th year option. Also the cost of a quarterback costs more in free agency, if you look at Kevin Kolb $63.5 million, $21 million guaranteed deal and Matt Flynn’s 3 year $26 million, $10 million guaranteed deal. Since I don’t want to make post way too long and I don’t know where you got the average eCAVOA stat for draft picks, I would like to see you look at say the Eli Manning trade and take the draft picks values and see the value if you plug in the other players value like I did above-for this it is probably better to use their approximate value from pro football reference up to now instead of eCAVAO this is because eCAVAO is a career stat, otherwise it would say a team would be better with Vince Young then Andrew Luck after one season, because he is older than him. Final thoughts on the trade, I think both teams actually did very well. St Louis already paid Bradford $50 million and needed to trade the pick. They got much more value then drafting Justin Blackmon, who they can probably get at 6. So a great trade for them, even if they are screwed if Bradford doesn’t bounce back. On Washington’s side they filled the position they also got excellent value as a star quarterback is amazingly important, and if he is top ten, which I definitely expect, will be of much greater value then trading the pick. I disagree with you because the #2 pick in the draft is worth about 2,700 points (#1 overall is worth about 3,000). The #6 pick is worth about 1,600 points. The #39 pick is worth about 505 points. If the Redskins average the 16th pick in the next two drafts then they would be giving up around 1,000 points per pick. This means that the Redskins are losing only around 1,500 points in this trade (7th overall). This means that RG3 would need to have a value of 4,200 points. Since this is 1,100 points more than the #1 overall pick. Therefore he must be a top 5 quarterback and because the chances off this are significantly low, this is a bad trade for the Redskins. RG3 Must be as good as Brees, BRADY, Manning, Rodgers and Rivers. Ah, but what if he IS as good as Brees, Brady, Manning, Rodgers and Rivers? All pocket passers, as the best QBs almost always are. and he hasnt even been close to any of those qb’s. Not too many folks talking about the potential starters lost from all these top draft picks the skins gave up. WHERE YOU AT NOW HARVARD??????????????????????? Excellent post — I’m glad the Post linked to it. Interesting to take a very long-term, rational economic analysis approach to football! you’re looking foolish now, Just confirmed the 2014 pick is 2nd overall. viewers, its really really pleasant article on building up new website. Wow! i’m so glad that if found your page I will be bookmarking this for later! Considering both teams are bad now, putting a discount on future value doesn’t make any sense. Who’s laughing at the so called “Harvard Nerd” now! I thought I would come back to this article after a few years just to see what people said. Sounds like he proved his side. We paid so much for so little. He had one good year. And I’m a kind fan, to the ones who doubted once again we were screwed maybe we should get this guy a gm spot.